Parent of a Preschooler?-We’ll buy your lunch! Bring your preschooler to the summer lunch program and we’ll buy your lunch! Thursdays at Heusner, Schilling, Sunset, Cottonwood, Church of the Cross, and Oakdale, Mondays at Salvation Army and Tuesdays at Kennedy; parents of preschoolers will receive a free lunch for eating with their child! Preschoolers will receive a new book and school readiness information. 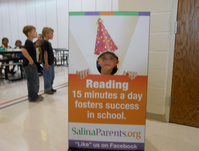 Check us out at www.SalinaParents.org or SalinaParents.org on Facebook. Join the fun!